Klein Tools (www.kleintools.com), the No. 1 preferred brand of hand tools in the electrical industry, as well as one of the leading brands in the maintenance, construction and industrial trades, today announced a partnership with the City of Sturgis, South Dakota, to serve as "Official Tool" of the legendary Sturgis® Motorcycle Rally™. The 77th annual rally is Aug. 4-13, 2017. 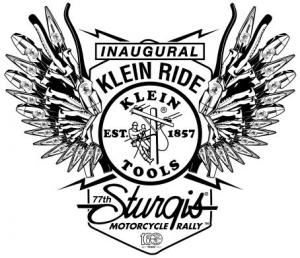 Klein Tools will be on-site during the Sturgis Motorcycle Rally to film behind-the-scenes footage of City of Sturgis electricians and operations crews at work – chronicling what it takes to bring power, light and sound to the event that draws more than 500,000 bikers from around the world every year. Following the event, Klein Tools will publish a Sturgis Rally recap video to its website (www.kleintools.com/america) and social media as an installment of its yearlong "Powering America's Passion" video series. From 9-10:30 a.m. on Saturday, August 5, Klein Tools will host an official “Klein Tools Electrician & Tradesman Ride to Sturgis.” The Klein Ride is exclusive to Klein Tools customers, professional electricians and tradesmen, and is limited to the first 100 riders who pre-register either online or at participating Klein Tools distributors in Rapid City, South Dakota. The 90-minute scenic ride will wind through the Black Hills National Forest and finish at the VIP Hospitality Village in downtown Sturgis. All participants will receive coffee and donuts during check-in, refreshments upon arrival in Sturgis, a Klein Tools bottle opener and a special-edition Klein Tools t-shirt. Checkin for pre-registered riders will take place Saturday, August 5, from 8-9 a.m. at Black Hills Harley-Davidson, at the Rentals Building immediately behind the dealership: 2820 Harley Drive, Rapid City, SD 57702. For further details regarding the partnership or the “Klein Tools Electrician & Tradesman Ride to Sturgis,” please contact the media representative listed above. Since 1857, Klein Tools, a family-owned and operated company, has been designing, developing and manufacturing premium-quality, professional-grade tools. Celebrating its 160th anniversary in 2017, Klein Tools remains committed to investing in U.S. manufacturing and maintaining its place as the No. 1 choice among electricians. For more information, visit www.kleintools.com. Klein is a registered trademark of Klein Tools, Inc.